Autoimmune thyroid disease is a common thyroid disorder that encompasses a number of conditions including Hashimoto’s thyroiditis, atrophic thyroiditis and Graves’ disease. Hashimoto’s thyroiditis presents on ultrasound as a hypoechoic, heterogeneous and asymmetrical thyroid gland. Other sonographic features of Hashimoto’s thyroiditis are micronodulation, fibrous bands, pseudonodules, hyperechoic regenerative thyroid nodules, and cervical lymphadenopathy especially in the central compartment. The ultrasound features of Graves’ disease are less marked than Hashimoto’s thyroiditis and include a diffuse goitre with reduced thyroid gland echogenicity and increased vascularity on Doppler study. The presence of thyroid nodules in hyperthyroid Graves’ patients requires further evaluation with thyroid ultrasound, thyroid scintigraphy and FNA biopsy of any suspicious and hypofunctioning nodules. Subacute (De Quervain’s) thyroiditis most probably has a viral aetiology and patients present with a tender thyroid gland and raised inflammatory markers. 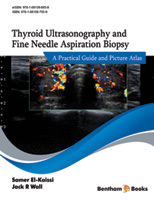 The thyroid gland displays hypoechoic areas with reduced Doppler flow on ultrasound. On the other hand silent thyroiditis and its variant, post-partum thyroiditis, present on thyroid ultrasound as a slightly hypoechoic and heterogeneous gland. There are two types of amiodarone-induced hyperthyroidism, type 1 which resembles Graves’ disease with increased vascularity on Doppler study and type 2 disease that is associated with destructive thyroiditis and normal or reduced vascularity.